If you want to experience hospitality at its best, head to one of Padstow’s most renowned restaurants, Paul Ainsworth at No 6. 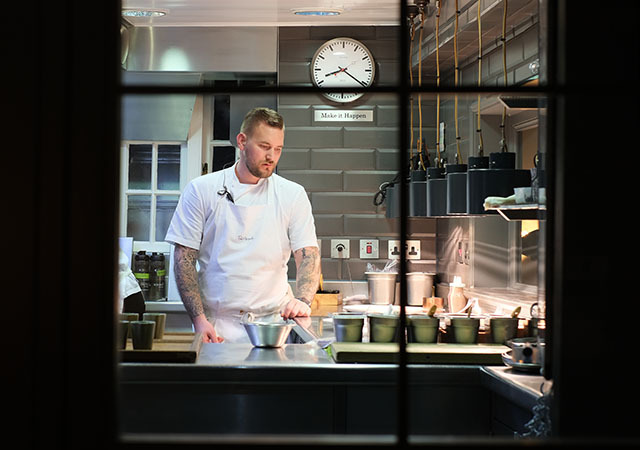 The restaurant has held a Michelin star since 2012, received its fourth AA rosette in 2016, and is listed as one of the Good Food Guide’s top 50 restaurants in the UK. From the moment you enter the beautiful Georgian townhouse in the heart of Padstow, you find yourself in a bubble of warmth. 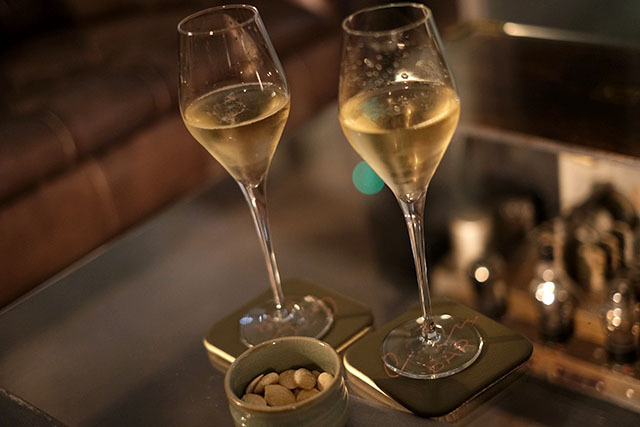 Guests are greeted like long lost friends by restaurant director Paul Dodd, coats are whisked away, and before you know it, you find yourself sinking into a sofa upstairs, glass of Champagne in hand. The bar is the most recent addition to the restaurant; Cici’s Bar is named after Paul and Emma’s daughter, and was created in 2017 when the restaurant underwent a refurbishment. This is a very grown up space, with comfy leather seating, soft lighting, and the walls are peppered with interesting works of art. Once seated downstairs, a bowl of crusty sourdough bread was delivered to our table, accompanied by butters in the prettiest little bowls. 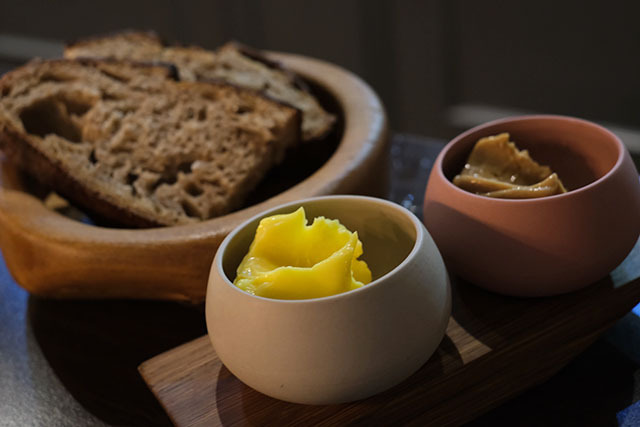 The butters are handmade in the restaurant; the yellow one deliciously salty, the brown one caramelised, sweet, salty, and ever so more-ish. 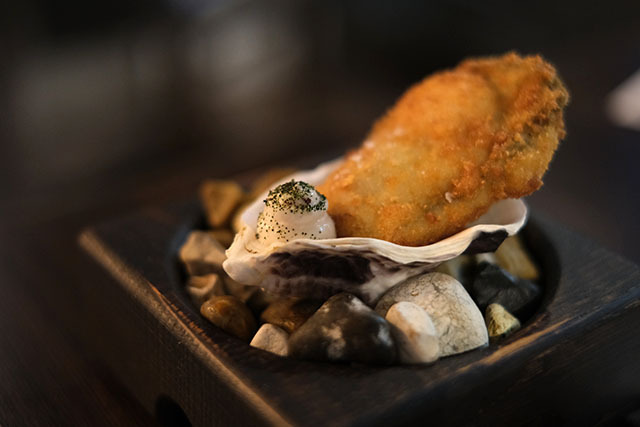 An amuse bouche was next; a crisp, deep-fried Porthilly oyster, which sat upon pebbles, and was served with seaweed mayonnaise. Sadly I can’t eat oysters, but the “Jammie Dodger” more than made up for it. 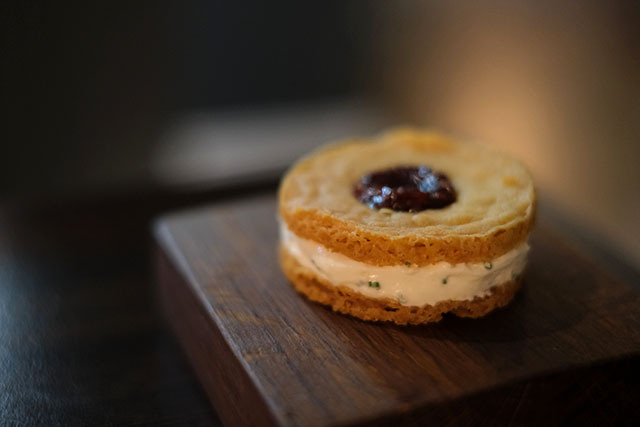 The buttery, crumbly, biscuits were filled with whipped Montgomery’s Cheddar and chives, with damson jam. The expression “melt-in-the-mouth” could have been coined for this joyous biscuit. Jim’s starter was the pig’s head fritter, made using Cornish Tamworths. 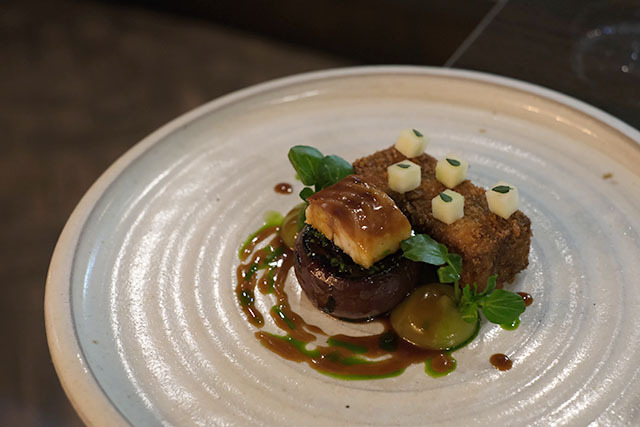 Succulent, shredded pork was pressed, breadcrumbed and deep-fried, and served with roast onion, perfect cubes of apple, a chunk of smoked eel, pickled cucumber, and a beautiful sauce to bring all the flavours together. Sarah Clements, No 6’s sommelier, selected wines to complement each course. For the pork, she chose Sierra Cantabria Rioja Blanco, Spain, 2016. For my starter, I chose scallops, and these specimens from Orkney were the largest I’ve ever had. 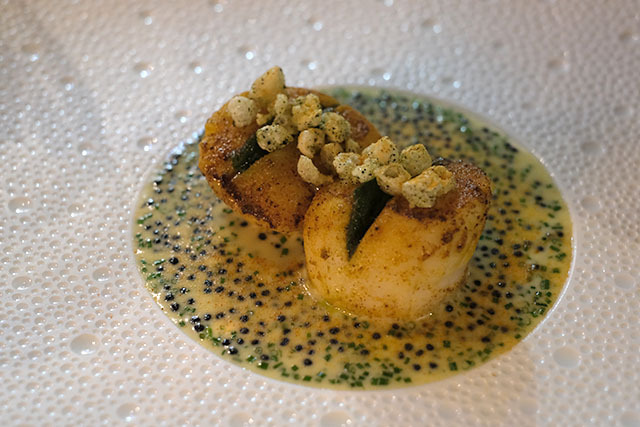 Plump and juicy, they were stuffed with herbs, topped with puffed pig skin, and served on a rich beurre blanc which contained both powdered scallop roe and caviar. This dish tasted of the sea, in the most wonderful buttery way, and the classically French, dry Domaine Louis Michel Petit Chablis, Burgundy, France, 2017 was the perfect match. We were then very spoilt, with a special extra course of soy-glazed Grampound Road duck. Poached and roasted (perfectly pink) breast sat upon confit leg meat. 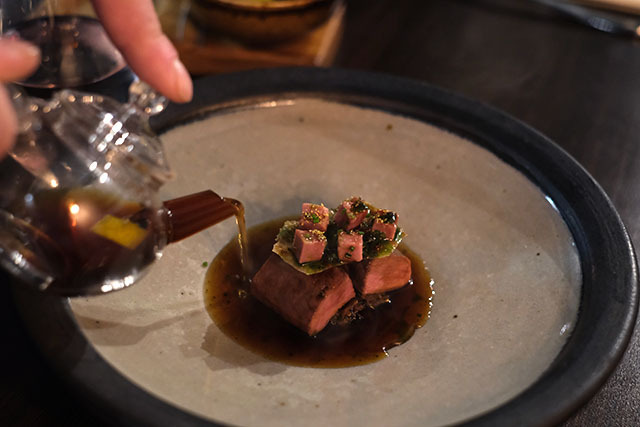 This was served with little cubes of smoked duck breast, crispy chicken skin, and a Peking tea broth, infused with Lapsang Souchong. Alongside the duck was a “pick your own” salad: a bowl of immaculately prepared tiny salad leaves and slivers of cucumber which, when combined with the duck, reminded me of the flavours in a Peking duck pancake. This was paired with a spicy, fruity red, Milestone Series Crossroads Syrah, Hawke’s Bay, New Zealand, 2013. The fish of the day was monkfish, beautifully cooked, and oh so flavoursome. A generous portion of the fish, roasted on the bone, was accompanied by leeks and crab meat, and jack shell gravy, which is a sauce made from the shells of male crabs. The acidity of the oaky Lugana DOC Molceo, Otella, Italy, 2015 cut through the rich, creamy sauce. I’d seen one of Paul’s new dishes, chicken “Tournedos Rossini” on Instagram, and was keen to try it. This is the No 6 take on what was originally a French steak dish named after the Italian composer Rossini. 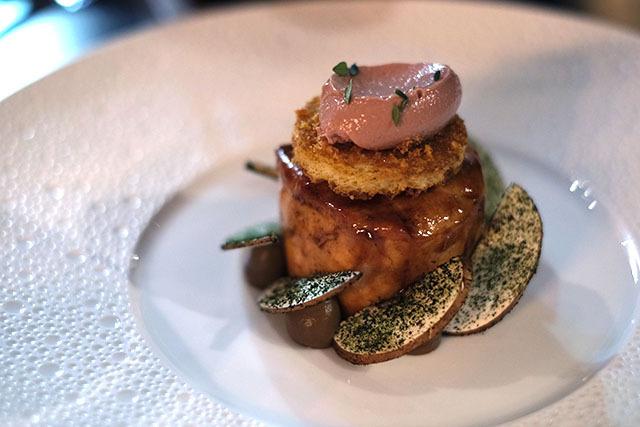 Here, the chicken is brined, poached and roasted, making it beautifully succulent, topped with a brioche crouton and chilled parfait, and served with slices of chestnut mushrooms and a rich jus. I enjoyed the accompanying light, fruity red, Cerasuolo di Vittoria, Paneta, Sicily, 2016. Jim ordered bread and butter pudding for dessert (I was too full for pud!) and it was a very special version of a British classic. The deconstructed pudding had all the elements of the original, each part delicious in its own right but, when combined, sublime. 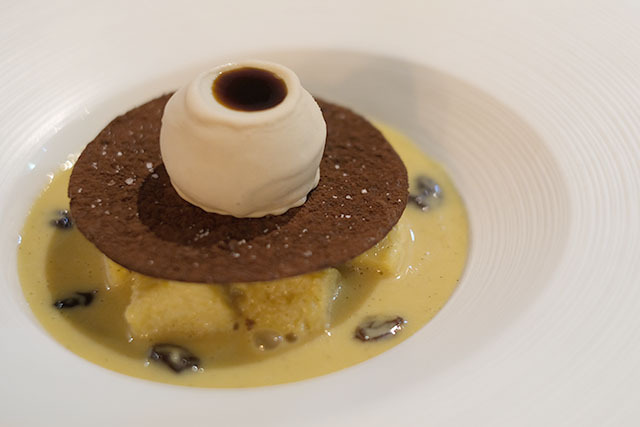 Balanced on top was a thin praline-y biscuity disc, and a ball of roast vanilla ice cream, with a little pool of Pedro Ximenez sherry. 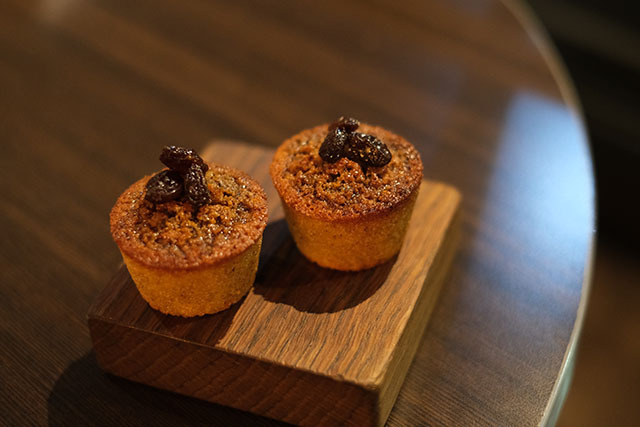 I opted for peppermint tea and petits fours, the highlight of which were little almond and syrup financiers, gooey and sticky, and a lovely way to end a meal. Paul Ainsworth at No 6 is open for lunch and dinner from Tuesday to Saturday. As well as an à la carte menu, at lunchtimes there is a set menu, currently £25 for two courses or £29 for three courses. We’ve tried this (of course we have!) 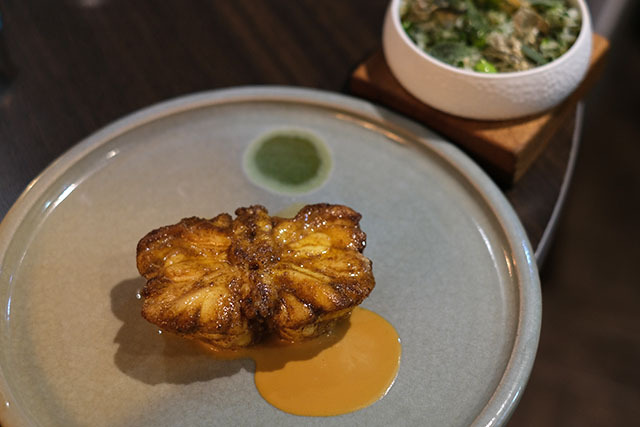 and can vouch for it being delicious, and one of the best value Michelin-starred meals around. Watch out for some exciting news about Paul Ainsworth and head chef (pictured above) John Walton’s new venture, being launched next year. Keep an eye on social media for updates. For more information or to make a reservation, visit www.paul-ainsworth.co.uk/number6 or phone 01841 532093. Disclaimer: We were guests of Paul and Emma Ainsworth, and were looked after very well. Thank you to Paul, John, Sarah and team for their generous hospitality. Photography: All images by Jim Michell, Barefoot Media.